I participated in a campaign on behalf of Mom Central Consulting for Heinz Vinegar. I received a product sample to facilitate my review and as a thank you for participating. Before moving to the South I had only used vinegar to clean out my coffee maker a couple of times a year and to make salad dressing. Not only has my cooking become more sophisticated but now I supply many different types of Vinegar at any one time. You are bound to always find the large sized bottles of Heinz Apple Cider vinegar. You may be asking for what? 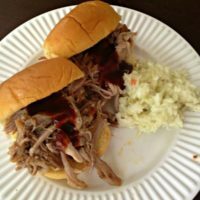 I recently posted my new quick pulled pork recipe and realized I had not ever blogged about the original North Carolina Crock Pot Pulled Pork Recipe I have been making for years. Some friends that used to live in Va but moved home to South America came for a visit and I wanted to give them a true Southern welcome home. 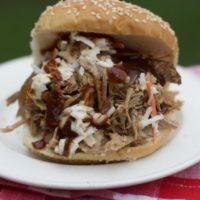 So I decided to make this traditional pulled pork recipe, using Unfiltered Apple Cider Vinegar and also make some Simple Homemade BBQ sauce with Heinz Apple Cider Vinegars I received to review. I also found this amazing tip for the Heinz Vinegar Website: Adding two tablespoons of Heinz® White Vinegar per quart of water before boiling eggs will prevent cracking, and the shells will peel off faster and easier when they’re done. 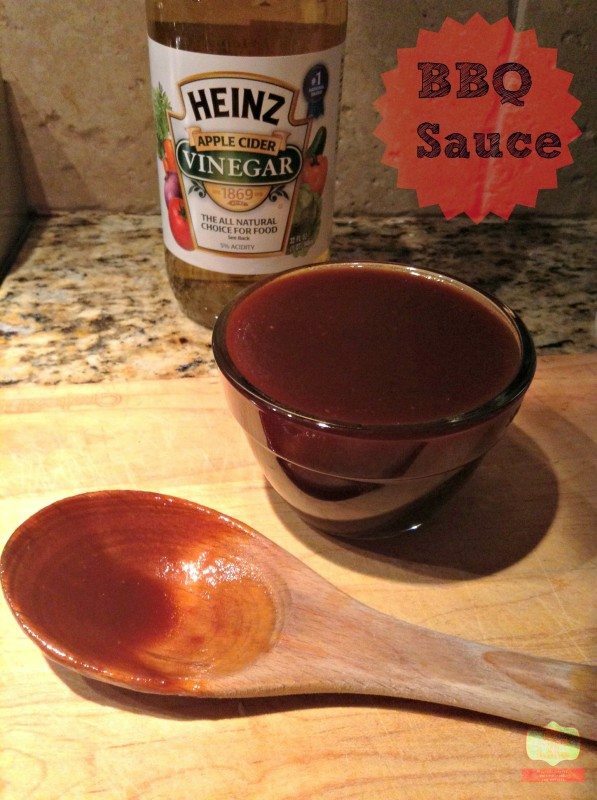 For other amazing Vinegar uses, check out the newly launched Heinz Vinegar Pinterest Page. 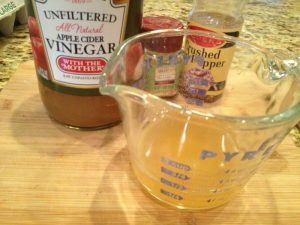 Who knew you could make teas and smoothies using unfiltered apple cider vinegar? I will definitely be repining some of these amazing recipes. 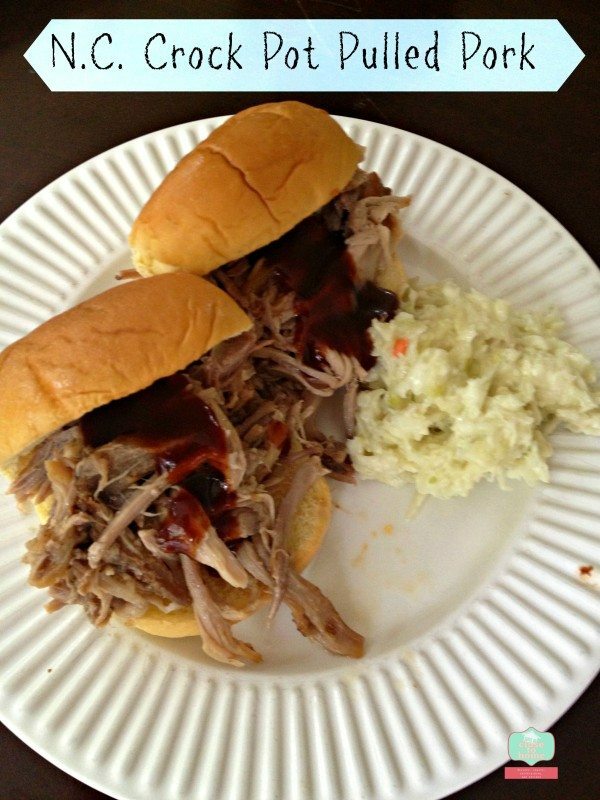 Homemade BBQ Sauce for pulled pork recipe Serve this lip-smacking sauce on hamburgers (steaks, pork chops and chicken. Once you taste this, you'll find endless ways to use it. It's not just for grilling! In a medium saucepan over medium-high heat, combine all ingredients and bring to a boil. Reduce heat and simmer, covered, for 10 minutes, stirring occasionally. Blend brown sugar, paprika, salt and pepper; rub over roast. Drizzle about ⅓ of mixture over roast. Cover and refrigerate remaining mixture. Cook roast on low for 8-10 hours. Remove meat and onions, and shred meat and onions if desired. Add more of the vinegar mixture or serve along side. Serve with your favorite BBQ sauce on the side as weel. Serve plain or as sandwiches. I used a crock pot liner to allow for easy clean up. How much liquid smoke did you pour over the roast? Eastern NC BBQ is the BEST 🙂 I’m just slightly biased seeing as how I’m a N. Carolina girl, but I love the vinegar based sauce! This is a favorite in our house. This looks amazing. I’m going to print this and try it! Awesome I need a zucchini recipe for tonight, going to check it out. Thanks for hosting Friday Food Frenzy! I added in a zucchini-lemon-chevre pizza today. I don’t have a crock-pot…but I will find a way to adapt this! Yummy in my tummy! We do love our BBQ in the South y’all! 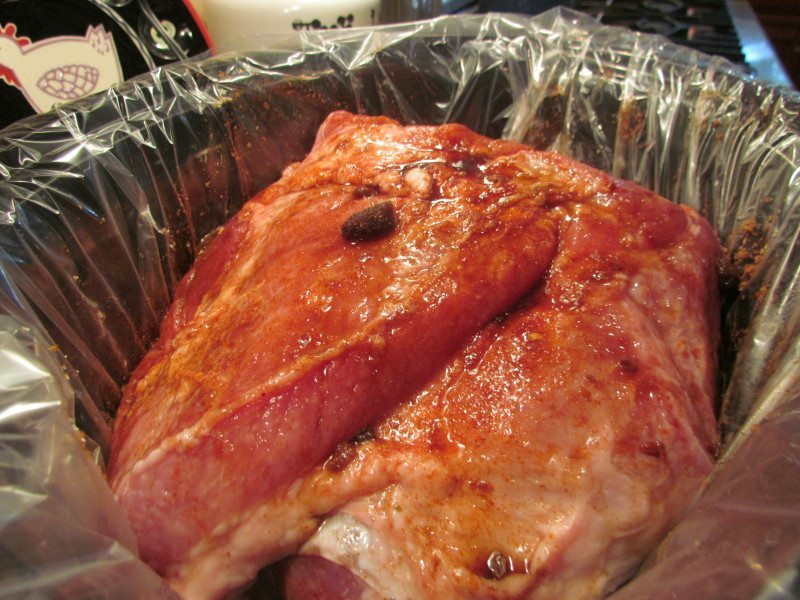 Hi Maria, this crock pot pulled pork recipe looks so good. 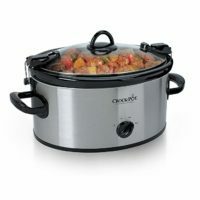 I love using a crock pot for recipes! I know right, I am definitely trying it too. hope it does not change flavor of eggs. The bbq sauce recipe is so easy I hope he likes it. Not a sweet BBQ sauce a little on the vinegar side! I am sure you have some amazing things they will eat as well. YOu could always make some for yourself and freeze small portions!! 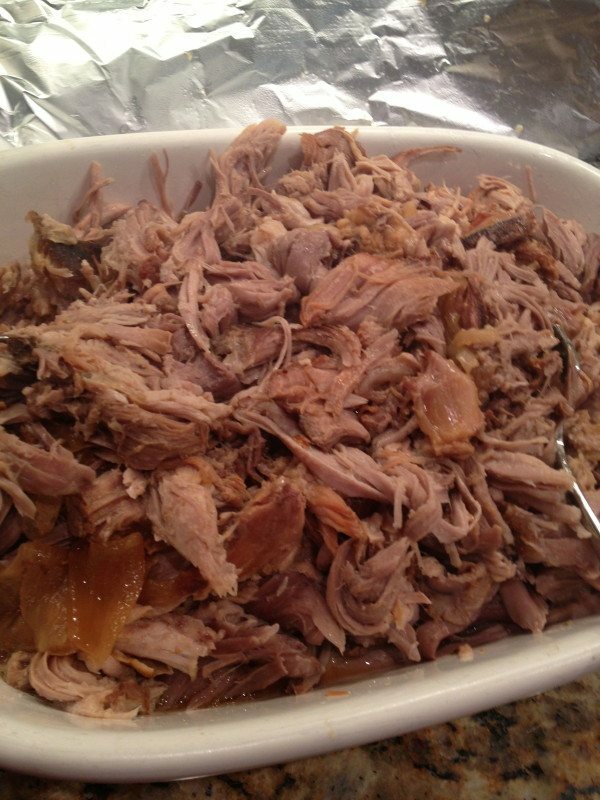 My other pulled pork recipe linked here makes a smaller amount. Hum-never knew apple cider vinegar in with eggs made them easier to get the shells off–definitely going to try that! 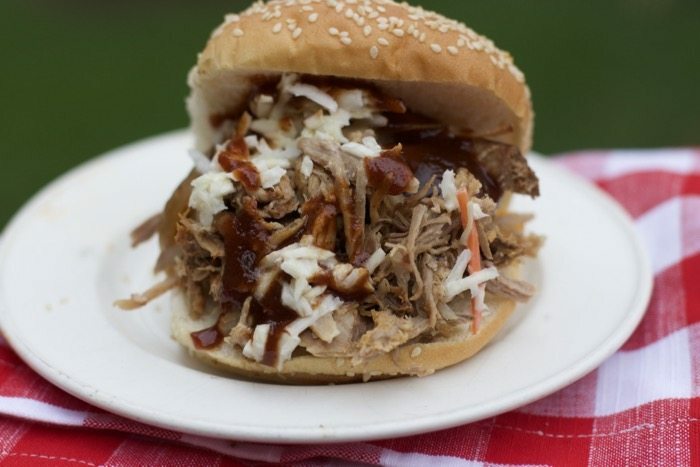 Your pulled pork looks absolutely delicious. My mouth practically started watering looking at your pictures. I’m definitely saving your recipe to make soon. Thanks for sharing! I have never made homemade BBQ sauce before. I can’t wait to try this recipe! I hope I get it right because I have a hard time finding store-bought BBQ sauce that doesn’t contain HFCS. Bull’s Eye is the only brand that my store carries and my hubby doesn’t like it. Vinegar is awesome! This looks delish! I’ll have to try this one! !